BIG SALE!! GEMSTONE KWAN YIN CARVINGS BIG SALE!! 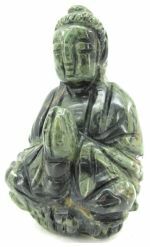 Aventurine carving of praying Kwan Yin, the oriental Goddess of Compassion. Aventurine is a healing stone that fosters integration of the emotions which enhances creativity, clarity and a pioneering spirit. The name of the goddess Kwan Yin (also Guan Yin or Quan Yin) means "One who Hears the Cries of the Suffering." 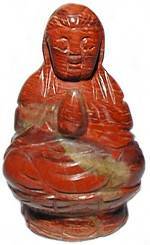 Auspicious Red Jasper carving of praying Kwan Yin, the oriental Goddess of Compassion. Red Jasper is said to be a stone of justice, assisting to rectify unjust circumstances. It is also thought to be protective. Kwan Yin (also Guan Yin or Quan Yin) means "One who Hears the Cries of the Suffering." 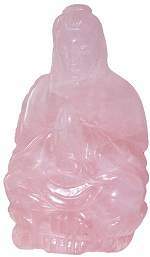 Rose Quartz carving of praying Kwan Yin, the oriental Goddess of Compassion. Enjoy the beauty and gentleness of Rose Quartz, called the Lover's Stone. It can be used to radiate the soothing love energies in your home or office. The name of the goddess Kwan Yin (also Guan Yin or Quan Yin) means "One who Hears the Cries of the Suffering." 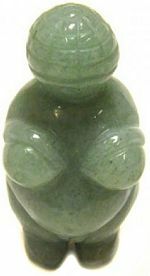 Beautiful Kambaba Jasper carvings of praying Kwan Yin, have light to dark green hues with interesting random black circular patterns. All Jaspers are mystical stones and Kambaba Jasper is said to soothe anxiety by focusing the mind on cleansing and detoxifying one's self and one's environment. The original "Venus of Willendorf" found in 1908 Austria and dated back to 22,000 BC is the oldest known carving of the Earth Mother archetype, also known as Gaia. It was probably a fetish carving used to attract fertility and the abundance of the earth. People have enjoyed the beauty and gentleness of Rose Quartz, known as the Lover's Stone. It can be used to radiate soothing love energies in your home or office. 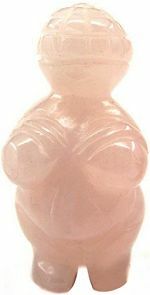 Hand cut and polished Earth Mother carving in Rose Quartz, a powerful soothing stone. The original "Venus of Willendorf" found in 1908 Austria and dated back to 22,000 BC is the oldest known carving of the Earth Mother archetype, also known as Gaia. It was probably a fetish carving used to attract fertility and the abundance of the earth. Tiger Eye exudes assertiveness and drive, it energizes the body and focuses the will. Hand cut and polished Earth Mother carving in Tiger Eye a powerful energy stone. 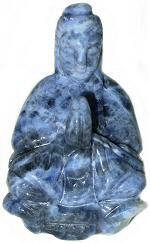 Sodalite carving of praying Kwan Yin, the oriental Goddess of Compassion. Sodalite promotes companionship and self-esteem, it unifies individuals towards a common purpose. The name of the goddess Kwan Yin (also Guan Yin or Quan Yin) means "One who Hears the Cries of the Suffering." 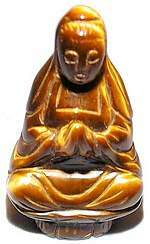 Tiger Eye carving of praying Kwan Yin, the oriental Goddess of Compassion. The name of the goddess Kwan Yin (also Guan Yin or Quan Yin) means "One who Hears the Cries of the Suffering." Tiger Eye melds the vibrations of Sand and Sunlight, synthesizing the energies of Sun and Earth, which energize the body and focuses the will to fulfilling heartfelt dreams. 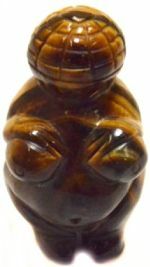 The original "Venus of Willendorf" found in 1908 Austria and dated back to 22,000 BC is the oldest known carving of the Earth Mother Goddess archetype, also known as Gaia. It was probably a fetish carving used to attract fertility and the abundance of the earth. Aventurine fosters integration of the emotions, enhancing creativity, clarity and augmenting the pioneering spirit. Hand cut and polished Earth Mother carving in Aventurine, a powerful healing stone.